850.04 FR Long Sleeve T-Shirt - Gray - Key Work Wear Online Store - - Key Imperial Bib Overalls, Key Bib Overalls, Key Jeans, Key Dungarees, Key Contractor Grade Double Front Denim Dungaree, Key Coveralls, Key Logger Dungarees, Key Logger Shirts, Key Shirts, Key Welder Shirt, Key Blue Chambray Shirts, Key Coats, and Polar King Outerwear, KEY FlameOut FR work wear, KEY FR Denim Bib Overalls, KEY FR denim Jeans, KEY FR Denim Dungarees, KEY FR Coveralls, KEY FR Shirts, KEY FR Hi-Vis Vests, KEY FR Insulated Coats, Jackets and Bib Overalls, KEY Hi-Vis ANSI II Class 3 Hi-Vis Pocket T-Shirts and Vests, KEY Freezerwear, KeyWorkWear.com exclusively features only KEY Industries Inc. Apparel, Shipped Factory Warehouse Direct To You, KeyWorkWear.com is your Factory Direct source for KEY Work Wear! 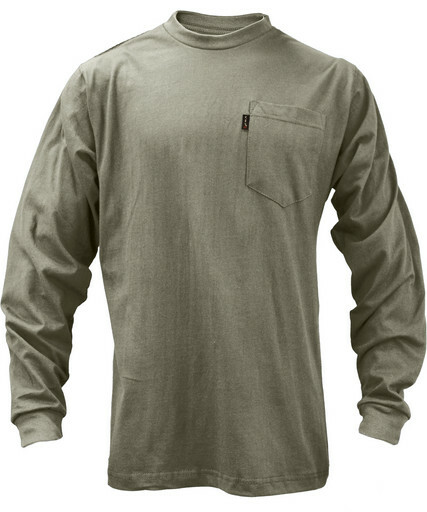 Key's Fire Resistant Long Sleeve T-Shirt puts FR fabric next to your skin. Operation and Maintenance of Electric Power Generation, Control, Transformation, Transmission, Distribution Lines and Equipment. Covers workers during the Installation, Operation or Maintenance of Electric Supply and Communication lines and all associated equipment. Standard on Flame Resistant Garments for protection of industrial personnel against Flash Fire. Standard for Electrical Safety in the Workplace. To be used as Secondary Personnel Protection Equipment Only - Not Flame Retardant. Guaranteed to be Flame Resistant for the Life of the Garment if proper care and maintenance are followed as recommended. Double Shrunk prior to garment construction in order to provide a proper fit. Designed with FR Pocketing and FR Thread.